Cool factor: Penti. Half-frame. Exists in many funky (East German) colors. Requires Rapid cassettes. Class (however you define that): Voigtlander Vito IIa. Small is relative, and cool is subjective! In 35mm classics there would be plenty of folders to choose from. My favorite is the Retina II; the Voigtlander Vito series is a great one too. If you allow the larger size of non-folding cameras, best recommendation would be a Barnack Leica such as the IIIa. On the 35mm modern line, that would be the XA series of which my favorite is the XA2. The Rollei 35 has a lot of loyal fans too. In 120 size, small means folder. Smaller sizes are 4.5 x 6r such as the previous Super Ikonta post, or the Daichii Zenobia, to name just two. I find the 6x6 size more convenient so I use a Nettar. I guess all things are relative and as mentioned the definition of "cool" will vary. as will the definition of "small". I think Bill responded first on and hit two winners in my corner. The Fed aka Leica II replica. These are quite small and it won hearts quickly for that reason alone...in the pre-war period. Another pre-war beauty is the same series as bosignore_eiko displays above, the predecessor 645/520 the standard Ikonta. This is punching above it size for sure. And then yet another plug for the beautiful Vito II. I have three variations of this model, the older original Vito, made for paper format 828 can still take a 35mm cassette.. and it is quite small, but classy. Although a post-war camera.. .and similar to the Vito in concept... but of course leagues away in class, quality and build etc (NOT!) 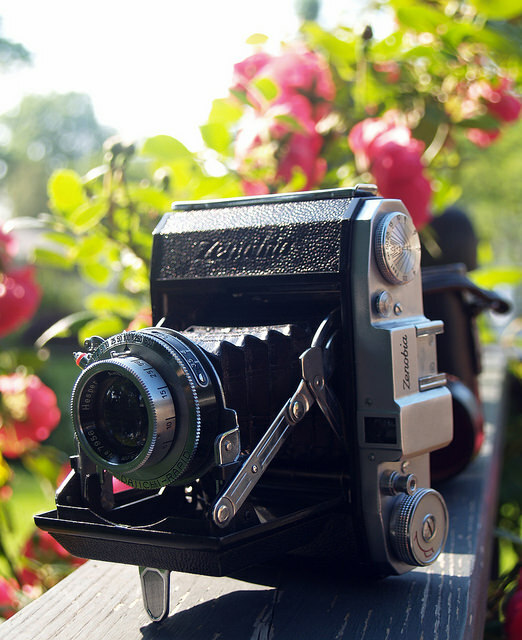 is the esteemed Contessa from Zeiss Ikon. A fine collection there, Chuck! I can take it or leaf it, but it is not in vine. nice cameras, tho! The XA-2 is often less expensive than single use cameras and has programmed automation and an f 3.5 lens. Clamshell cover so no case is needed. Works from ISO 25 to 800. Works off a pair of MS 76 cells. For mechanical operation I stand by my earlier recommendation of the Rollei 35. Another possibility might by the Petri Color 35. I agree on the XA-2 (or the slightly newer XA-3) as a really nice pocketable, tough camera that makes good pictures without exotic film or batteries. The XA-3 is an XA-2 with automatic DX-code reading and a correspondingly necessary exposure compensation, otherwise the same as the XA-2, which you can compensate by fudging the ISO. 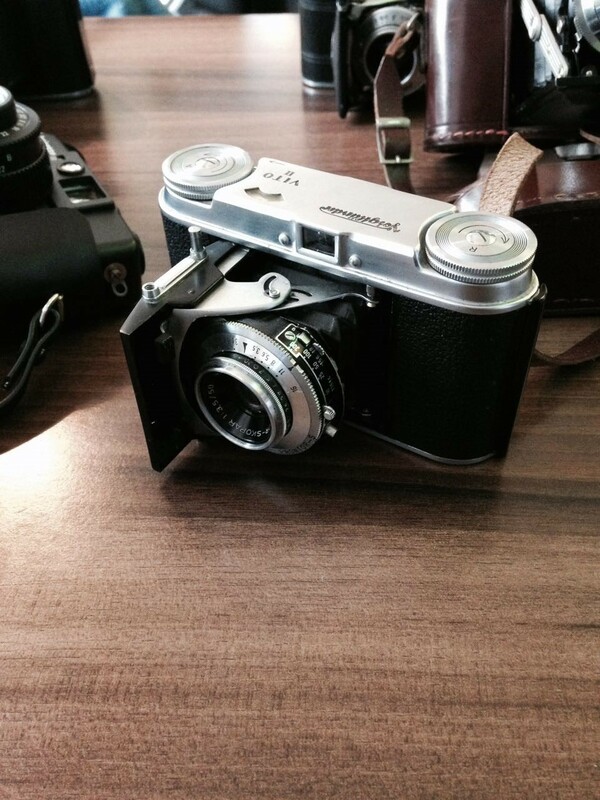 The rangefinder XA is nice too, but the XA-2 is nearly perfect for quick point and shoot use. All the XA's shoot and wind nearly silently. For funkier and less convenient, a case-less Barnack Leica or its Russian counterpart with a collapsible lens will easily go into a shirt pocket, small but heavy. With a decent lens those can take about as good a picture as can be taken, and can make a very classy beater. If you're not daunted by 127 film, the little Foth Derby, which owing to vulnerable aluminum construction can often be found cheap in less than pristine condition, is good fun. It's a folding camera with a focal plane shutter and a folding uncoupled viewfinder. You can be pretty sure you'll be the only one in a group pulling one of these out. Or of course the Rollei 35, but they're a bit pricey these days. I have a nice black body Rollei with what was at one time at least the red-headed stepchild of lenses, the Schneider Xenar, and some nicely devaluing dents at the corners. 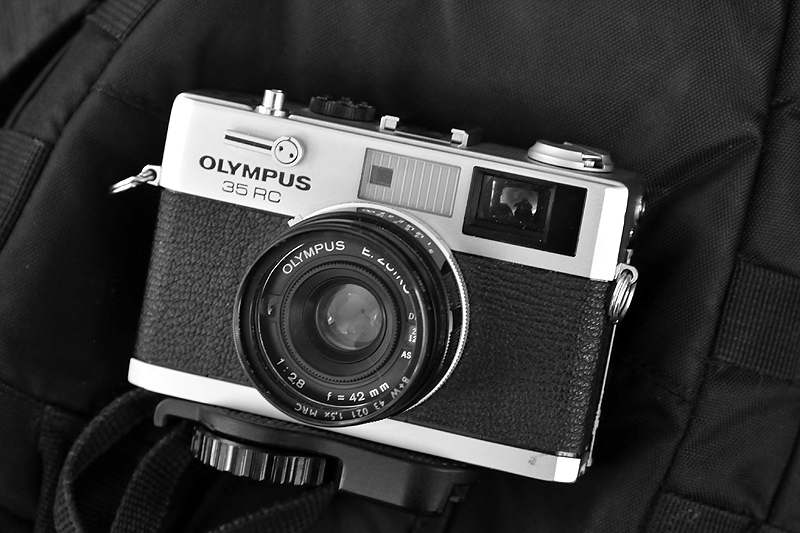 With its square construction and collapsible lens, it's not quite as easily pocketed and drawn as the Olympus XA. There are a variety of other compact 35's not much bigger than a Rollei, but less odd, such as the Sears35 (a Ricoh 500 relabeled), or the Olympus 35 RC. Both of those are nice and sharp, using outdated batteries, but working OK with modern alkalines sometimes, and fully functional manually. 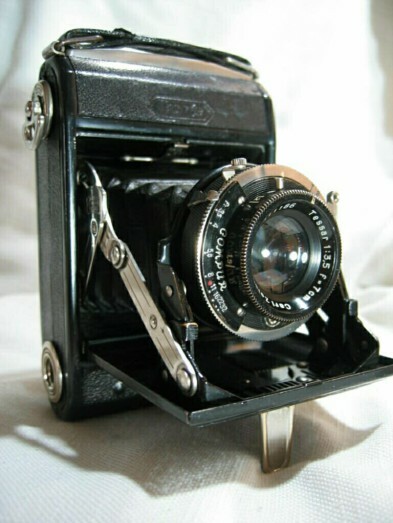 Voigtlander Vitessa (1950s), or Mercury half-frame (1940s). Like that Zenobia! I have a Waltax Junior which is not dissimilar. But if the OP is trying to out-cool a Bessa with a little folder, what about a Virtus? Also love the Derby. I have one. Having a FP shutter on something so small and simple is great. However, mine came with plenty of holes in the shutter cloth. I have a Voigtlander Vitessa L, but the rangefinder has become disconnected from the focus knob/dial. My usual camera repairman in Wisconsin (Hansen) refused to work on the Vitessa. 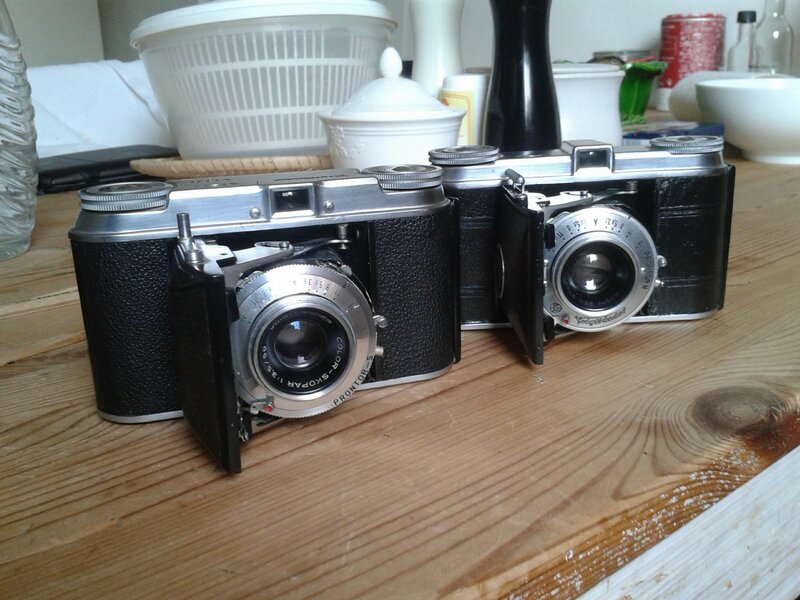 Anyone have any suggestions on who can work on the rangefinder? The rest of the camera is in beautiful shape. My Vitessa L has the same problem. Not a fan of messing with rangefinder repairs so I just scale focus mine. Back in the film days I experimented in a bunch of different options including the Minox 35GT (no rangefinder), the Kodak Retina (no meter), Contax T2 (limited control and expensive), Minolta 7sII (lens hadn’t aged well in the copy I got), etc. What I ended up with has it’s own new problem now and that is a battery that can’t be purchased today (there are a couple of options but not necessarily great ones). That as the Leica CL with the 40mm lens. Now though, the meter has packed up entirely so I’d like to answer this question myself. There are digital options but they’re all pretty expensive (e.g. Sony RX100’s). The Voigtlander VC meter (if it still exists) can fix a lack of a meter so maybe that opens up the options? Yep, the 531, aka the Super Ikonta A, is hard to beat for a small camera that delivers with a BIG negative (6x4.5), especially one of the late ones, like bonsignore_ezio's, as shown above, with the Synchro Compur shutter and coated lens. Another range of cuties are the Konica Pearl 645 cameras. The early ones are priced fairly reasonably, but the late models go for big bucks -- often more than a clean Super Ikonta A. One of my favorite 35mm folders -- or a range of them actually -- are the Kodak Retina IIc and IIIc/IIIC cameras. Beautiful build quality with excellent optics. I'm not sure how the Vitessa is set up, but many old Voigtlanders used a tricky rangefinder mechanism that involved two glass blocks that are glued together. If the glue bond breaks from impact or perhaps even age, the rangefinder is essentially done for. It might be possible to glue it back together, but I'm not sure how you'd calibrate it. When they're working, these rangefinders are bright and good, and immune to fungus and the like, but like the little girl with the curl when they're bad, they're horrid. The Foth Derby is certainly an unusual camera, 127 half-frame. I had to completely rebuild the shutter. The shutter has a "mule kick", it is quite violent. Another one with a lot of character is the Univex Mercury II. Not that hard to overhaul if necessary, but very hard to find a specimen without severe corrosion of the cast body. It's 9/16-frame, not half-fame. (4-1/2 sprocket holes per frame.) Do stop the lens down enough, say to f/8, it's a "not that great" triplet. Uses 135 film, but scanning is a pain due to the bizarre frame size.